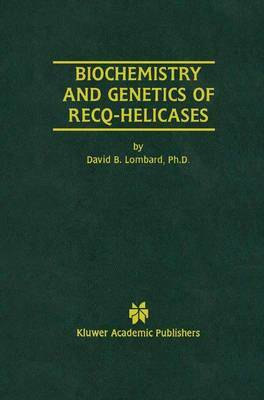 Biochemistry And Genetics of RecQ-Helicases provides a background into the role of helicases in general and RecQ helicases specifically in DNA repair. Helicases- enzymes which break down hydrogen bonds between nucleic acid strands in a nucleoside triphosphate-dependent manner-are ubiquitous in biology, participating in processes as diverse as replication, repair, recombination, transcription, and translation. The RecQ-family helicases are a group of helicases which have important roles in the maintenance of genomic stability in many organisms. In humans, mutations in three RecQ-family helicases lead to disease. This book thoroughly examines these helicases. Mutations in the BLM gene lead to Bloom syndrome, a disorder characterized by a susceptibility to many types of cancer. Mutations in the WRN gene cause Werner syndrome, a disease which in some respects resembles premature aging. Finally, mutations in a newly characterized RecQ-family member, RECQ4, may lead to the very rare recessive disorder Rothmund-Thomson syndrome, a condition characterized by developmental abnormalities and some aging-like manifestations. This book is intended for any researchers invested in these particular disorders, or with a general interest in DNA.